Once enabled by your account administrator and once you have completed the initial setup steps as shown in our Set up two step authentication article you will be able to sign in securely with two-step authentication. Go to the sign in page and enter your email address and password as normal. 2. On your mobile device, open your authenticator app and enter the current 6-digit authentication code. 3. Click Verify to validate the code and access your account. 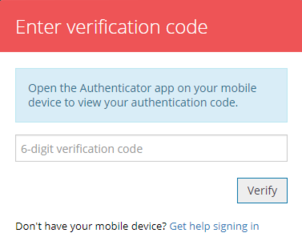 If you need help signing in please see our Troubleshooting two-step authentication help article.